Dogecoin Rates gives you the ability to create your own Dogecoin Ticker that support 163 currencies. Also it contains Historical Market Data for all currencies since 2014, which means you can build a fully operational and stats backed website in minutes with market volumes, daily open and close prices and higher/lower prices. 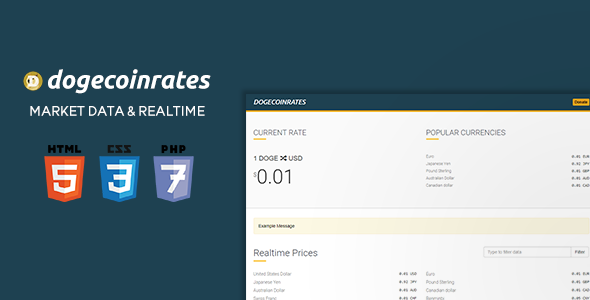 Dogecoin Rates also offers you a complete admin dashboard with over 40 features that allows you to control features, customize, monetize and much more anywhere.